Bags are one of the most useful products on the planet and they are therefore one of the best tools for marketing your brand. When you are able to give your customers a high quality bag that reflects your business it will advertise for you wherever it is taken. 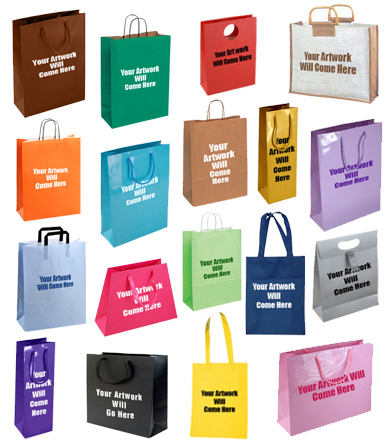 Good quality bags can be used time and time again, which means your company name, logo or slogan could be seen by hundreds of people each day. So when you want to get the message about your business to a wider audience and help the environment at the same time by having reusable bags, take a look at our impressive range. 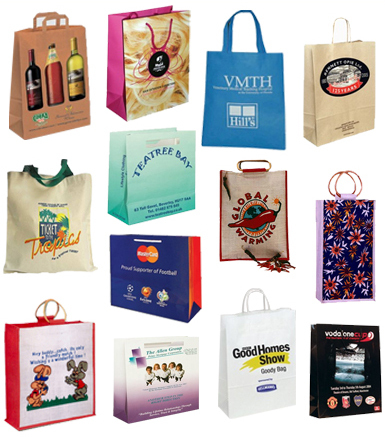 We want to be the only place you turn to when you are looking for printed bags, which is why we have such a huge range. By printing your choice of design onto any of our stock bags (you can also add matt or gloss finishes) or onto your own custom made bags to your exact specifications we can provide you with the product that you want. The bags that we currently have available are made from: jute, Kraft paper, cotton or art paper, we also have a range of stock bags that can be ordered at short notice for rush orders. Add to this a choice of handles (they can be made from rope, cane, paper, ribbon or cotton) and the option to use your own artwork and you can see why so many people choose us. It is important that you understand the differences between the types of bags that we have available. Making a mistake can be costly and frustrating, which is why you can compare the two types side by side to decide which would be the most suitable for you. Take a look at our online catalogue and choose the bag from our extensive stock range which can be printed with your choice of design. If you prefer to have a physical copy of our catalogue please request one and we will post it out to you. To get a quote on your choice of bag – you will need to specify the colour, size, material and style first, complete our ‘Request a Quote’ form and we will get in contact with you with a quote. If you would like to use your own artwork we have a dedicated FTP that you can upload them to our server. Once you have done this you can then state which images you would like to use and where you would like them to be positioned on the bags. Ordering is straightforward and you will find our secure online store takes you through every step. Telephone orders are also accepted. You will also be provided with the estimated delivery date when your order is accepted. Be assured that we only use the best distributors to ensure that all orders reach you in perfect condition and on time. Payment can be made by any of the major credit cards, most debit cards, postal order, bankers draft, bank transfer or cheque. We recommend every customer to read the following outline before ordering printed bags. Difference between Custom made/Bespoke bags & Overprinted/Screen Printed Bags & Hot Foil Hot stamp or Embossed. 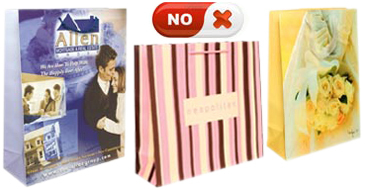 Most of the customers get confused and make wrong decision ordering their printed bags. That's why we have made the following explanation for you to make the right decision and save money and time. A choice of the number of colours you need using a 4 or 6 process. Printing on material that is flat. For example cotton or paper. Pricing for two colours is highly affordable and the price does not increase for three colours. Bags feature a bottom gusset and can be printed on the side gussets. Any shape of bag can be created, subject to design. Choose the thickness including: 150, 170, 190, 210gsm and upwards. Choose from gloss finishes, matt finishes or no lamination on the final product. Lead time – Rush 4 – 6 weeks from our factory overseas. Standard time 8 -10 weeks. Pricing will depend on the design of the bag and what it incorporates i.e. artwork, type of handles, quantity. Pricing will be cheaper in most cases, than screen printing costs. Samples can be ordered for around £150.00, when you place your first order this amount will be changed to reflect this. If you would like to place another order using the same screen there will only be a £35.00 charge to set up the screens. All boxes come in plain packaging with barcodes on printed or sticky labelling. There is a one off cost that is associated with plate and film with all first orders. For the four colour process prices start at £125.00. VAT is applied to all customers within the UK. Customers ordering from other countries, including the EEC, will only have VAT will only applied where it is applicable. Overprinted bags are the perfect choice for businesses that are looking for high quality bags made from a range of materials: Jute, luxury art paper, cotton, Kraft paper or non woven at a cost that suits their budget. As all printing is onto stock bags that are already made the printing and shipping process is much faster. The sizes, thickness and shapes of all our stock bags is available to view on our website. You can usually have your choice of print in one or two colours. Six colours is sometimes available based on the supplied artwork. Pricing for will increase based on the colours that are used. For instance one colour is cheaper than two. Bags do not has bottom gussets and printing on the side gussets or the inside is not possible. If you require a laminated finish please choose the appropriate stock bag from our catalogue. Lead time – Standard time for printing in our UK based factory 1 -3 weeks. Overprinted bags will be charged using the cost of the stock bags, the cost of the screen and the delivery charges. Pricing will be more expensive than bespoke designs and bags as all processing is UK based. Samples can be ordered for around £90.00. If you would like to place another order using the same screen there will only be a £35.00 - £50.00 charge to set up the screens. Carton marking and packing – as per your request for carton marking, all boxes come pre packed in 25, 50,100,150 etc. Part delivery is sometimes required prior to the full order being shipped. All boxes come in plain packaging with barcodes on sticky labels. There is a one off cost that is associated with plate and film with all first orders. For the one colour process prices start at £50.00, for two colours £75.00 etc.